So, I look at the Statue of Liberty quite a bit. Twice daily, in fact. But I don't really think about it often. 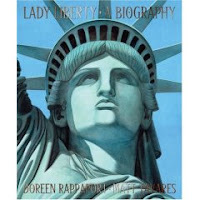 Doreen Rappaport's Lady Liberty A Biography opened my eyes not only to the building of the Statue of Liberty itself, but also gave me insight into what New York City and the United States were like during this time period. Told in verse, Rappaport chronicles the building of the Statue of Liberty from idea to completion from a number of points of view. From the salons of Glatigny France in 1865, to the workrooms in Paris in 1876, to the foundation pit of the statue in 1884. From the newsrooms of New York City in 1885, to Bedloe's Island and the big reveal in 1886, Rappaport brings readers in. Professors, sculptors, assistants, engineers, poets, construction workers, journalists, and children all played their part. The illustrations by Matt Tavares are simply breathtaking and seem to hearken back to the time period in question. Rappaport makes her own connection by setting the first poem in New York City today from her point of view, and then goes on at the end to add quotes from people who saw the statue for the first time. Also provided are a list of Statue of Liberty dimensions, and a timeline of important events, as well as a list of selected sources for further reading. This is another title that perfectly compliments our New York City curriculum as well as our immigration curriculum. It's also simply fascinating for a casual reader.